Drop 1 tablet into toilet bowl before donor uses restroom. This ensures toilet water is NOT used for the specimen. 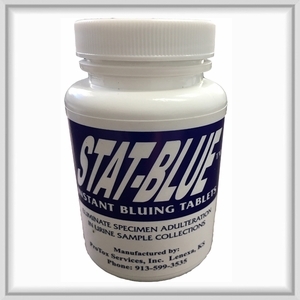 STAT-BLUE Tablets are designed for the drug testing market to provide the required blue color in the toilet bowl water prior to a urine collection. and will eliminate donor tampering and/or sample adulteration (as mandated by Federal Regulations). These bluing tablets only require seconds to produce a deep blue color in the toilet bowl. Collectors who have become accustomed to the tablets ease-of-use also appreciate the economy of this bluing technology. No mess on the collector�s hands from handling tablets and the cost per collection is considerably less than tablets or food coloring.